Mt. 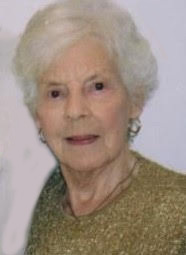 Healthy - Lucine Dorothy Erb, 96, of Cincinnati, Ohio passed away on April 5, 2019 at Hospice of Southwest Ohio. Lucine was born on June 2, 1922 in Norwood, Ohio to the late George and Margaret (Barnes) Rolfes. Lucine is preceded in death by her husband of 71 years Richard L. Erb; two brothers, Daniel Rolfes, John Rolfes; two sisters, Eunice Day and Janet Kramer. Lucine was a member of the Church of the Assumption for 95 years. Lucine is survived by her two sons, Richard L. “Rick” Erb Jr. (Beth), David Erb; two daughters, Sister Cheryl Erb, RSM, Vicki (Phil) Gall; two grandchildren, Lindsey (David) Schrader and Michael Gall. Visitation will be on Wednesday, April 10, 2019 from 5:00pm to 8:00pm at Paul R. Young Funeral Home, 7345 Hamilton Ave, Mt. Healthy, Ohio, 45231. Mass of Christian Burial will be on Thursday, April 11, 2019 at 10:30am at Church of the Assumption, 7711 Joseph Street, Cincinnati, Ohio, 45321. Interment to follow at St. Mary Cemetery (Mt. Healthy). In lieu of flowers, donations can be made to Mercy McAuley High School, 6000 Oakwood Avenue, Cincinnati, Ohio, 45224. Condolences can be made at www.paulyoungfuneralhome.com .